GAIN GREAT POWER WITH LESS HEATThe NZXT X62 Kraken series is a powerful all-in-one CPU Hydro Cooler that features two 140mm fans, addressable RGB channels and NZXTs signature mirroring effect to provide stunning lighting, all controlled by CAM’s software interface. Users can fine-tune settings for performance using the advanced controls to optimize their gaming sessions. Everything on this industry-leading cooler has been re-engineered to bring you the greatest liquid cooling, and is all supported by an impressive 6-year warranty. innovative new generation technology The Kraken Series hosts a new pump that is quieter and capable of displacing more liquid than past generations. This future-proof design achieves superior cooling efficiently while keeping sound to a minimum level. INTUITIVE CAM INTERFACE Give your cooling extra flair with the X62’s on-board lighting, with advanced RGB modes and infinite-mirror effect. You can use CAM’s intuitive dashboard to truly personalize your lighting, with customizable presets or special reactive modes that responds to changes in your system, such as temperature and audio output. You can also independently fine tune the pump and fan performance with total ease. RADIATOR FANS WITH COMPLETE POWER The X62 Kraken comes fitted with two Aer P140 PWM fans, which are designed for liquid-cooling perfection. It also includes a chamfered intake and fluid dynamic bearings, which provides you with silent operation and powerful cooling. FORTIFIED NYLON SLEEVED TUBING Strong nylon sleeves are added to the cooler to fortify the rubber tubing by giving it an added protected layer. Your Kraken cooler tubes will be easily shielded from potential damage during handling. NZXT Kraken X62, 280mm All-In-One CPU Hydro Cooler with RGB Lighting, CAM Control, 2x140mm PWM Fan, w/ AM4 Bracket, TR4 is rated 3.5 out of 5 by 8. Rated 5 out of 5 by MrVelocity1577 from Smart looking design I chose this product for it's appearance and knowing that NZXT produce high quality products. The only downside is the Mobile monitoring software doesn't work with CAM anymore and was a good way to keep a check on my PC when I wasn't near it. 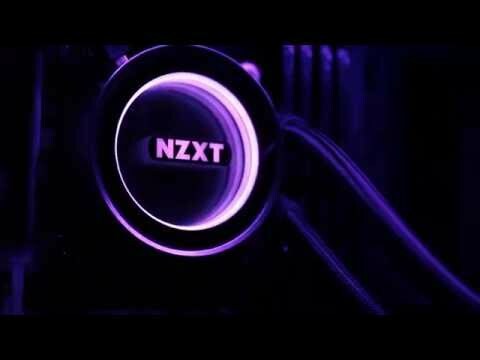 NZXT make quality products but they don't have the quality in their software. Rated 4 out of 5 by Taffy from Great Performance, but I suffer with bad luck... I feel although that the price clearly reflects the performance you're getting with this product, however, after one year and five days the Pump inside the AIO failed. This may just be unlucky, however, for this reason I have to give this product a low quality rating. On the other hand this comes with a Six year Warranty and NZXT were quite happy to send me a replacement, as such I believe that this product is well worth the value, my concern is mainly the quality of the components and how long after the waterway ends will the product last. Rated 4 out of 5 by FuriousDave from Decent install, but check it fits your case! I was filled with a moment of dread when I thought it wouldn't fit my case. However, checking the manual I had the option of mounting it at the very front of my chassis. So, check it fits! I think if the cabling could be a little tidier, it'd be a fantastic product - currently you have to plugin in a usb into the pump and a CPU_FAN into the motherboard. Perhaps the reason for this is that you need to control the lighting with software? Rated 5 out of 5 by PeteAsleep from Good looking AIO. Works well Had this AIO for a couple of months now on my 6700k overclocked to 4.7ghz and it works well (Have had 4.8Ghz with this and it worked just as well). On 'silent' or 'high performance' it keep the temps between 50 - 70 degrees under load. You have to use the CAM software to set it up which can be a bit buggy but over all I really like the Software. So far I've had no reliability issue. Very happy so far. Rated 4 out of 5 by Clarkey from Decent AIO Overall this is a nice quality AIO. It is dependent on NZXT's 'CAM' software to configure the settings. Although the software looks nice, it seems a bit slow / buggy and uses quit a bit of CPU when on-screen (it's fine when minimized to tray). Once installed I noticed that the AIO fan speed was reporting 0 RPM in the CAM software. I looked online and other users were having the same issue. I read the instructions again to confirm I had installed everything correctly but everything was fine. Turns out that on the fan splitter (which comes off the pump) there is only one fan socket which has 4 cables connect to it, even though they are all 4 pin sockets. You have to connect one of the AIO fans to this 4 cabled socket for the fan speed to report correctly. It doesn't mention this in the instructions, it only says to plug the pump into a 4 pin header on your motherboard. It may seems obvious now but I assumed they were all 4 cabled sockets so thought I'd mention it. I have Corsair Vengeance RAM and it is extremely tight. I almost didn't install it because it really didn't want to go. I'm not sure this is a good thing for heat dissipation on the RAM. Make sure your RAM isn't too thick / tall if you are on an ITX motherboard. I'm aware that others have issues with the pump failing after 4 months or so. I can't comment on this as I've only had it installed for 2 days. Rated 4 out of 5 by Benin from No faults Had this for almost a month, I see a lot of trouble people have with this but I haven't had a problem with it. Little on the pricey side but works just as well as any other AIO. keeps my 7800x at 40c gaming and 70c full load on the 'silent' profile which lives up to its name. Look online for guides on installation though, the manual that comes with it is useless. Rated 1 out of 5 by Gareth13 from Pump Broke These things are incredibly weak, I have installed it twice and the pump has broken on me. I opened it up to check and an incredibly small copper wire that powers the pump has snapped. We are talking about an unprotected 1mm wire. For £150 i expected better. Can I install this in top of my case? I have Thermaltake View 31 case, Asus Strix z270E Mobo, Corsair Vengeance RGB High Profile Ram. I really don't want to install it in front, I just want to make sure if it fits in the top position of my case with no interfere with my Ram modules. Thank you so much. Does this come with the brackets for an i7 9700k Socket 1151? Yes, it does. All 8th and 9th gen LGA 1151 sockets are supported. I have that exact same processor and it works great.